Redhouse Barn is a wedding venue in Stoke Prior, near Bromsgrove in Worcestershire. Redhouse Barn is a beautiful rural wedding venue set in the Worcestershire countryside, combining traditional vintage style and contemporary design. The barns is set in 5 acres of grounds and romantic mature gardens, giving the perfect space for those stunning wedding photos. One of the great and rare things about Redhouse Barn is their motto - 'Your wedding, your way' which is something that speaks to me. Much like this venue, I'm not one to try and sell you a set package, limiting what you can and can't have, which is why I keep things simple - one price for all day wedding photography and unlimited photos included. Vicky and Rob got married in their local church in Worcester before moving on to Redhouse Barn for their wedding reception. Unfortunately it started raining the second we stepped out of the church, so we chose to take the formal wedding photos inside the ceremony room at the Barn. To give the images that extra kick, I used a set of studio lights so make sure the scene was perfectly lit. Having your wedding photos indoors shouldn't mean the quality suffers! 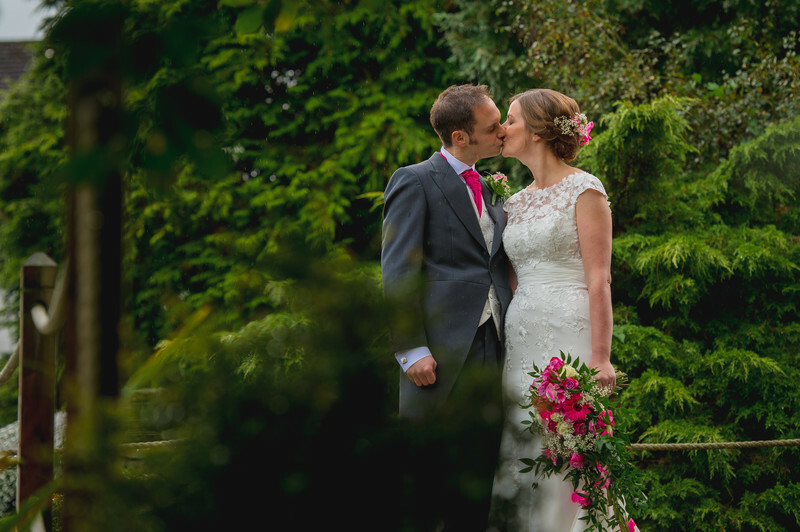 Despite the rain, we still made it outside for some lovely photos of the newly married couple. Redhouse Barn allows you access to a private garden to the side of the property that features a lake and a large decked area. Whilst a small part of a large venue, the photographic opportunities are many and varied. To view the Redhouse Barn wedding website, click here. Location: Redhouse Barn, Stoke Prior.